Schools, Museums and Lodges: Elks, Shriners, Moose, etc. The Higgenbotham team is as diverse as it is large, with people who specialize in every facet of the operation. From auctioneers to real estate brokers and agents, and information coordinators to marketing professionals, no other firm has the team that Higgenbotham has assembled. 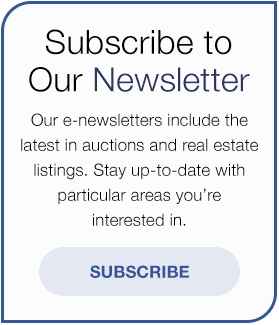 A dedicated team of auction and real estate professionals will be focused on your property from day one to auction day. They are not only experienced, they are also passionate about service to our clients. The team will be with you every step of the way, answering your questions and keeping you up to date. Since 1959 we have applied that same level of passion and dedication to the sale of your property at auction. For further details and a Free Market Evaluation, call us at (800) 257-4161 or send us a message if you have questions. Laura has worked in the purchase and sale of properties at auction for more than 10 years. She started her position with Higgenbotham as an auction manager providing coordination and completion of the due diligence process that leads to the creation of our comprehensive property information packages prepared for each and every property we sell. Since 2008 Laura has been the Administrative Assistant to the President, assisting with buyer inquiries, client coordination, and sales inquiries. Laura has been a Licensed Florida Real Estate Agent since 2005 and is a Member of the Mid-Florida Regional MLS (covers most of central Florida), Lakeland Association of Realtors, Florida Association of Realtors and National Association of Realtors. Donald Kirkland has brought 26 years of experience to Higgenbotham Auctioneers. Donald has been a professional Florida Auctioneer and real estate agent since 1995 and past Vice President and past board member of the Florida Auctioneers Association. Donald conducts Estate and Business Liquidation Auctions, Real Estate Auctions and more than 40 charity auctions a year. Contact Donald to discuss how an auction can help you achieve your goals, whether buying or selling. Angie’s primary responsibilities include overseeing office operations and coordination; assisting with auction planning, execution, and follow through; human resource functions and oversees revenues, costs, operating budget and expenditures. Angie is also a licensed Florida Real Estate Agent. Chris has had an extensive career in the real estate development and auction business, covering over 25 years throughout the United States. Chris has been a key executive and manager in the land investment, development, construction, leasing and end marketing of over 9,500 residential single and multi-family units in 9 western states and participating in the auction of several hundred real estate assets. In his auction career, Chris has successfully been a project manager and team member of several multi-property auctions in California, Kansas, Texas and Louisiana. Chris is also a licensed California Real Estate Broker for over 30 years. Donald is a strong and intuitive professional with entrepreneurial experience in all facets of sales and the marketing of commercial, government and institutional real estate. 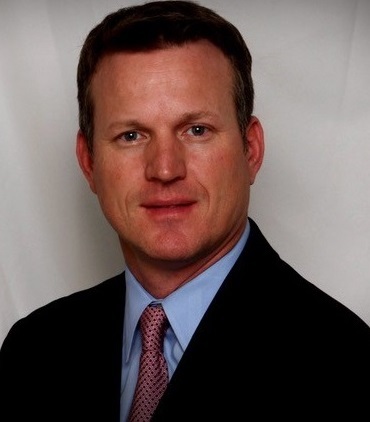 He is a CCIM and has been in the sales and marketing business for his entire career. 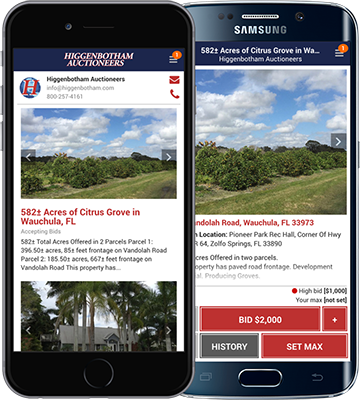 His Real Estate and Auction experience spans many states and over 30 years of deal making. He is a licensed Kansas Real Estate Broker. Jamie Sellers has worked in the real estate and financial services industry since 1996, raising capital for commercial real estate investment trust (REITs), business development companies (BDCs), and private-equity real estate funds. He is a licensed auctioneer (FL#AU3913) and real estate agent (#SL3384306). After realizing the increased institutional demand for commercial real estate auction services, Jamie began to pursue his career in the commercial real estate auction sector specializing in working with institutional real estate fund managers and consulting them on the benefits of selling commercial real estate on an auction platform. Gabrielle is the first point of contact for clients and buyers at Higgenbotham Auctioneers and is responsible for collecting, analyzing, processing and disseminating information on all of the auctions we hold. She assembles our transactional marketing reports, which include all buyer contact with the company prior to an auction as well as assembling the other data from advertising and marketing to complete these reports for our seller clients prior to our auction. These give our project managers and clients an accurate picture, before the auction, what is likely to happen at the auction and give us a basis for follow up to get the transactions closed on time. Gabrielle is expert on all MS Office programs and gets the information the company needs to do a great job for its clients and buyers.